It is a beautiful day in North central PA, and after a morning of meetings with students and grading, I am taking a break to enjoy my porch. I did some initial flower planting of Hyacinth bulbs, and now I am waiting for the UPS delivery and for a former student to stop by. One of the requirements of this new issue with my liver is to continue to lose the necessary weight to provide my liver the best chance to regenerate. That means cutting back to approximately 1,700 calories a day and walking at least five miles a day. I am working on the calorie plan, mostly to understand what consuming only 1,700 calories entails, and then figuring out creative and tasty ways to do that. The walking element is not difficult, but it is time consuming. However, after about three hours of grading this morning, I did manage to get 7 laps in around the quad. That is almost 2 miles. With the other walking today, my trusty phone tells me I am up to almost 3 miles for the day. I really quite enjoy a rather pedestrian sort of walk. I do not try to speed walk or set any sort of amazing distance; it is to manage a steady and comfortable pace. Most of the time I wear my Wi-Fi earbuds in an just enjoy whatever I choose to listen to, be it classical, folk or classic rock, and even at times country. If it were not for the grey hair and white beard, I might pass for one of the students and their technologically saturated lives (at least I can hope that is the case). Over the years, I have added a pretty wide variety to my repertoire of listening. I have give Sarah (Hansen ) Jacobs a great deal of credit for my interest and continuing love for classical music. I remember as a sophomore in college how she would give me clues about a particular piece as push me to see who it was by understanding the style and characteristics of a particular piece. She would provide hints. I remember her offering me classical Greek passages also as I was struggling my way through Dr. Hutton’s first semester Greek course. She was a sort of precursor to Dr. Brandes and my music history classes and certainly a bit more personable and enjoyable that the Greek class. Over the past few days, spring as definitely sprung here and I have been working in my yard. BTW, it is a couple days later since I began this post. Today was a day of cleaning, moving things, rearranging, and organizing. I need to be much more intentional about this. As I cleaned and organized, the duplicates I found of things are beyond what one might imagine, and there is a level of ridiculousness in all of that the defies logic in more ways that I probably have fingers and toes. One of the things that happened on my walk the other day was a playlist that sort of warped me back in my first couple of years as a student at Dana College. I knew of REO Speedwagon before I was a student there, and certainly owned their two albums, You Can Tune a Piano and Hi Infidelity. I remember two students my sophomore year who lived on the floor where I was an RA. Bret O’Reilly and Frank Polich. Frankie, as he liked to be called was a serious Kevin Cronin fan (one of the latter lead vocalists for REO). That group and the others in the title were part of my life as a student at Dana. I can remember my junior year roommate playing “Time for Me to Fly” out the window of my third floor Holling Room. I will not offer the reason, and while I found it amusing at the time, it was a bit brutal. To this day, however, my favorite REO tune is “Ridin’ the Storm Out.” A second song that morning kept me right back at that little Lutheran liberal arts college. Jefferson Starship (and yes, originally Airplane, but definitely more pop than the Airplane was) certainly covered a wide-range of genres from the psychedelic of the 60s, when Grace Slick epitomized the Haight-Ashbury scene, to their more pop sound of “Jane,” which was a song without either Slick or Balin. I think “Jane” managed to keep the group relevant as things were changing. Slick would come back and iterations of the band continue even now, but the 1985 release of “We Built this City,” provided the sound of Starship to an entire new generation of listeners. The next song to be offered as I walked the quad was from the group Fleetwood Mac and their Rumours album. I did not realize that was their 11th album, but I listened to this album so many times that first year I was on 4th Holling Hall with my roommate, Peter Bonde. I did not know nearly as much as I do now, but I sure did appreciate their music. To this day, I find Lindsey Buckingham’s guitar picking astounding. When I later learned about the drama in the group, it was even more (and still is) phenomenal they could put out such a significant group of songs with the stress they had to be living in. Perhaps that album epitomizes just how much passion their is in good music. Passion is such an important part of our humanity. Music has this unparalleled ability to transport us back to the place we were when we first heard the song. As I listened to these songs, I remember names and faces, and ironically since I posted some of them have commented on the FB page, one of the places I posted this. What this means is I am editing. It seems again, I have done some of my best proofreading after posting. I remembered floor shirts and intramural football games; and I remembered how music was my saving grace as I worried about whether or not I was smart enough to be in college. I remember playing my guitar for weekly campfires for Campus Ministry teams. I remember being blessed to have friends who still reach out. I remember David, a person on our floor from Kansas who would hang out in our room as he tried to get his bearing about him in being a college student. I was so fortunate to have a roommate that first year even though I thought I did not want one. I remember being welcomed by some wonderful people. The memories of travels to Wahoo, NE for a concert, a 25th birthday party thrown in my honor and classmates who stunned me in so many ways. I am still blessed to be friends with and to maintain those friendships through various social media outlets as noted, but those friendships are so much more dear to me now. I wish at times I could go back to that little campus on the hill. That is an entirely different story for another time. One of the nice things about being able to remember Dana for what it was is how the people there honestly changed lives, and that was not only because of the outstanding faculty, but it was the incredible classmates I had in my classes. There were so many capable and intelligent people in that little college. Yet, music was central to most of it. Between my stereo, my love for music that was more complicated than a 1/5/4 chord progression (and groups like Kansas would fall into that category), and then my opportunity to sing in the college choir for Dr. Paul Neve was something that affected my appreciation for the diversity and complexity of music in so many ways I had never known. I remember sitting in the cathedral in Lubeck as I traveled during an interim and listening to the music of Buxtehude. This experience was heightened and more profound because Buxtehude had lived in that very town, the town known as the Queen of the Hanseatic League, something that occurred with the rebuilding of Lubeck in the middle of the 12th century. I remember how I learned to appreciate Scandinavian chorale music from my time at Dana. It is something that gives me both pause and comfort to this day. I remember some incredible voices from my classmates from little towns like Fairbury, NE or from little Iowa towns. What I realize is the three semester class that was the highlight of my college career, and also the bane of the existence of others, was my Humanities course. What it taught be was to synthesize the world in which I lived. That is still the case today. As a child of working class parents, and please know that I am grateful beyond words for those parents – particularly when they adopted me, I knew very little about art, classical music, poetry, literature, or world history before the 20th century. I knew about going to church, working hard, basic meat, potatoes, and carrots, and jello salad or things at church potluck dinners. I knew about bakeries and working in a bakery and working summer jobs. I was exposed to some music between Sioux City Children’s Choir and church choirs, but I had little idea about how I would ever manage to go to college. In fact, I remember a serious argument my mother and I had because of the cost and her lack of knowledge of said costs. Yet, to this day, music, and practically any genre, is basic to my daily existence. As I think about the first couple of years at Dana, my living space was in Holling Hall. The first year I lived on Four-North, the home of the Raiders. The second year I was on Two-North, where I was an RA. That was an experience of all experiences and my third year, I was on Four-South until I transferred to the University of Iowa. My last year, I would come back to Dana and stated out in Holling again, but would move to Rasmussen Hall, which to this day, I know it was a difficult, but necessary decision. That semester in Rasmussen was perhaps one of the best times of my life. Studying Physiology and Anatomy with two floor mates and another young woman was outstanding for a history and humanities major. My RA saving my life, probably literally when another young man had a breakdown is still appreciated. Living on campus was an important part of daily life at Dana, and I believe integral to understanding the culture of that small campus. It was always a bit different being an older student, even though the age was not tremendously older. Yet in an exceptionally traditional Nebraska place, being 24 as a freshman was outside the ordinary. I think that is why music was so important to me. It kept me both grounded in my past, but living in the present. When I was a freshman, there was a Navy veteran on my floor. He introduced me to Jimmy Buffet and Moosehead beer. I appreciate Jimmy Buffet more than the Moosehead these days, but that is no big issue. At the time, I found Moosehead beer quite stunning. It was so much better than domestic swill. Today, I consider and remember Dana with a certain wistfulness. What I received there as a student and what students received for 125 years is no longer available. 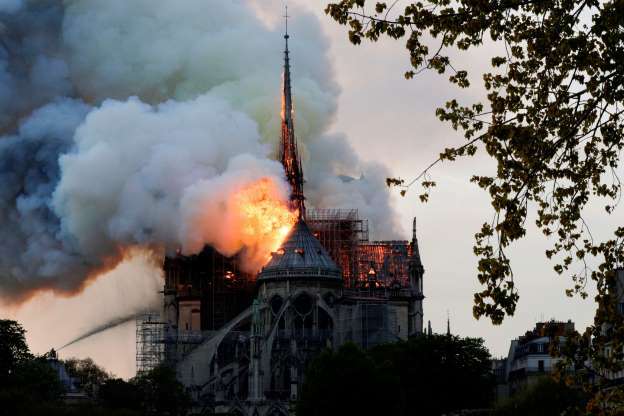 It is ironic as I write this some of the things I learned in my Art History lectures comes flooding back to me as the Notre Dame Cathedral is burning in Paris. I remember being in Paris in January of 1981 and seeing this magnificent structure. I remember learning about flying buttresses. What a tragedy this is. I am reminded of a smaller fire, but nonetheless devastating to those who were fortunate enough be in Old Main, the central architectural building on the campus when I was a student. There are so many important memories and experiences that shaped the person I have become personally, intellectually, and professionally. Yesterday, my father would have turned 104 years old. Hard to believe he has been gone for more than two decades, but much like the memories that I noted here, it is as if he lives on also. When people tell me I am a lot like him that is a profound compliment. As I move forward through another day, it is hard to tell what will spark a memory of the times that formed and molded the person I have become. What I know is I am the product of so many things: music, people, places, experiences. Each have contributed to the tapestry known as Michael Martin. Hard to tell what will create yet another design or layer. Yet, I am blessed to have time to create yet something that is a blend of the old and the new. That is the way things work. For the time being, here is a song from the past, and a shout out to my Navy classmate from my time at Dana. The picture above is from today and speaks to the fact that nothing is spared from the elements that create the world in which we live: fire, water, air, and earth. To those who have reached out in response to our mutual Dana memories . . . to my Dyak friends, my college choir friends, and those who mean more than I have appropriate words, thank you!! Seems apropos that Jimmy Buffet grace this post, so to my Navy classmate, thanks for the introduction. Previous Post Becoming Norman . . . Pleased or Chagrined?